Why use Corrugated Plastic or Paper Core Boxes? 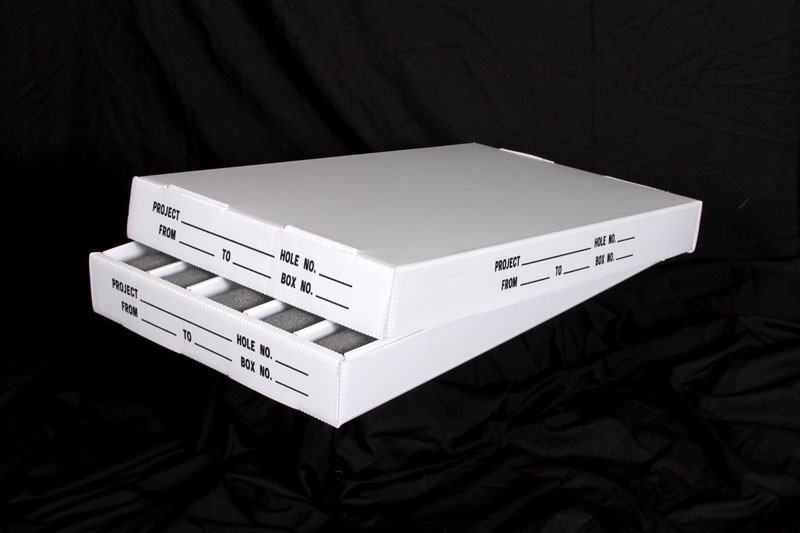 I am very familiar with both options as our company used to produce waxed Fiber Corrugated Core Boxes for over 20 years before discontinuing and selling only the Plastic Corrugated. When comparing we will select the best waxed option as there are several types of waxing available as well as different configurations of glues that can be used. The strongest combination is WRA (weather resistant adhesive) glue along with wax saturated (dipped in wax) core boxes. This being the “longest term” option in Paper it still has many issues that just can’t compete with the Plastic Corrugated option. Plastic Corrugated has many advantages over Waxed Fiber Corrugated especially in the type of environment that Core Boxes are many times exposed too. In some cases, core samples are stored in the boxes for a time outdoors where the sun and rain are a constant factor. In addition, the cores themselves could be anything from solid rock to a mix of wet soil. Some disadvantages for waxing paper it will add weight to the paper making it more expensive to ship. In addition, waxing gets very messy when exposed to heat and sun. It gets very slippery with heat and could be a hazard factor when handling heavy Core Boxes. Another big issue is Waxed Paper is non-recyclable. There is “NO” use for waxed paper other than landfill. Waxed Corrugated will eventually deteriorate and begin to delaminate and the harsher the environment the shorter the life of the Waxed Paper Box. Plastic Corrugated is ideal for Core Boxes. It is not affected by water or 99% of all chemicals. This makes it ideal for most all environments and is not affected by the wet core samples or rainy environments. It is very lightweight saving on shipping costs. Plastic Corrugated is also 100% recyclable. Many of our customers store their cores for years with absolutely no change in the performance of the boxes. We also have customers that reuse our Plastic Corrugated Core Boxes time and time again on new drill sites and additional projects.